Starting homeschooling can be super exciting... and super stressful. Over the weekend, I received a letter from a reader about whether or not to homeschool in Spanish. Blanca and I emailed each other back and forth some more and she also asked me how she should structure her day. I don't really have an answer for this because I think that everyone homeschools differently. And each homeschooling family is structured differently based on the needs of the family. That is the glorious thing about homeschooling: YOU get to decided how and when and what you are going to learn. I do think that each family goes through a period of adjustment when they first start homeschooling. It takes a little trial-and-error to figure out the best routine. And I think that it changes over the year. The biggest thing I learned when I first started was that timing is everything. A "lesson" should really only last 5 to 20 minutes, depending on the child. I was pushing my child too hard the summer before I started. Sitting her at a table with "fun" workbooks and expecting her to complete 5 pages. Pftht! ¡Que locura! After my curriculum arrived and I began officially teaching Kindergarten, I quickly learned the value of time and to keep things moving. We completed our daily lessons within two and a half hours. I think preschool will go by even quicker. All that said, I understand that a person has to start somewhere in order to get anywhere. 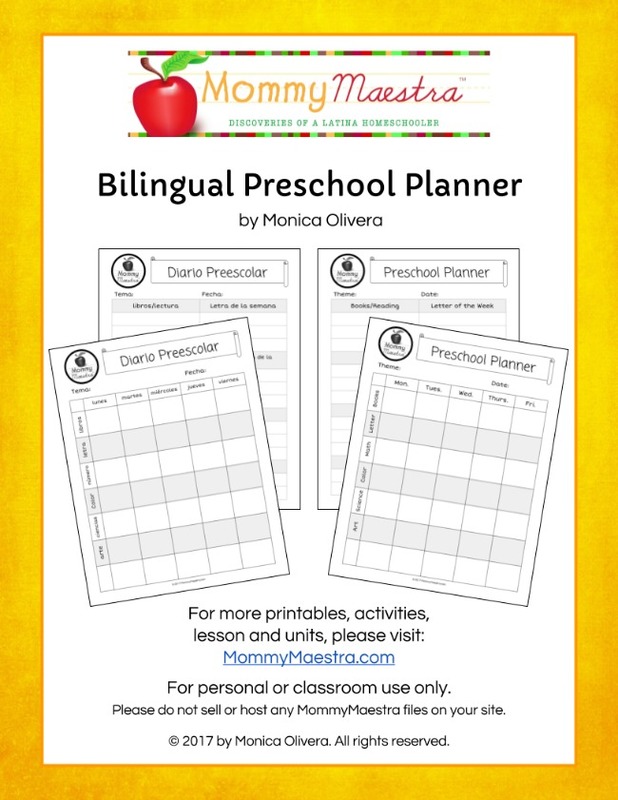 So I have created a set of bilingual preschool planning sheets, to help you get started. These sheets are not complete, as I have no idea how or what you plan to teach your child. But the point is to help you get organized and put your plans down on paper. Sit down Sunday night and plan your week. But remember to stay flexible and don't expect to accomplish everything you plan for the week. There are two sheets for each set: One in English and one in Spanish. Each sheet has extra room at the bottom for you to write in additional subjects (social studies, bible study, music, etc.) IF YOU WISH. Please don't feel like you have to fill it all in. They are completely black and white to save your color ink cartridges. Just print, hole-punch, and keep in a binder. If you download a copy, please let me know what you think of it. If you have a suggestion on ways to improve it for everyone, or if you see a mistake, drop me a message.